Home → Did you know? → Pitru Karma and Pitru lokha – What are our forefathers capable of? New Moon or Amavasa occurs when Sun and Moon come together. On this day the gravitational effect on earth is said to increase multi fold and is considered to be an auspicious time for religious activities and performing pitru karma (worshiping fore fathers). People who are not aware of the death anniversary of their forefathers can worship their forefathers on the Amavasa that falls in the Tamil month of Aadi (July – Aug.)Thai (Jan – feb.) and Mahalaya amavasa (Sep. – Oct.) This helps in preventing / lessening the effect of pitru dosha. Especially for people whose forefathers have not been taken care properly while living or people who have died with unfulfilled desires. Not doing pitru karma is said to be one of the greatest sins. When pitru karma properly done is said to make the ancestors happy..They act as the guarding deities of the family. Lord Vishnu says that he never accepts the offering of a devotee who has not performed his pitru karma properly. This shows how important is the rituals performed to ones ancestors. Pitrus enable divine blessings reach us swiftly without any impediments, when happy. Pitru karma include tarpanas on Amavasya days and srardhas on their death anniversary. These are the days when the forefathers are provided with food. Adhering to pitru karma strictly, enable in feeding them. 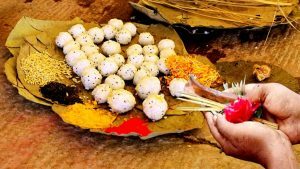 On these days they are said to comedown from Pitru loka and eagerly wait at our door step to accept the offerings. It is widely seen that for people who have not performed their karmas to their ancestors properly, have problems with their health or wealth or their children physically suffering. According to Garuda Purana, the pitru loka is said to exist milions of miles away from the Sun. 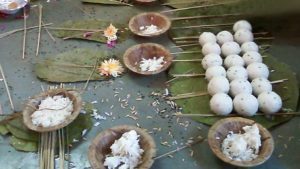 Pitru (ancestors) are said to bless their families from the pitru loka. On the day of amavasa the pangs of hunger will be high for the pitrus. Their hunger and thirst is satisfied by offering black sesame and water. After receiving these offerings they bless their families before going back to pitru loka. On days such as Thai amavasya, Aadi amavasa and Mahalya amavasa offering pitru tarpana on the banks of rivers /sea shore or confluence of rivers such as triveni sangamam, is said to be very auspicious. Worshiping Sun god is also said to be auspicious on these days. Even is one does not know the date of death of their forefathers, they can perform their pitru karma on the amavasa days. One can also offer food and clothing to the needy old people and get the blessings of their ancestors.